Scoot is a whole group (or small group) game that gets students up and moving about. 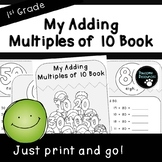 Students will be reviewing adding multiples of ten to a two-digit number. The only materials required are the recording sheet (last page) and the task cards. 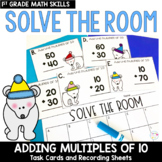 Included are 24 task cards and the recording sheet. 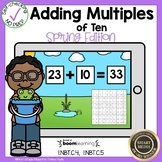 A great game for adding multiples of 10! Students draw 2 cards and use the place value mat to model the problem with popsicle stick bundles or base 10 blocks. If they are correct, they roll the dice and move their game marker on the gameboard. 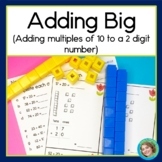 This game provides students will an opportunity to practice adding multiples of ten to 2 and 3 digit numbers. It is a great way for teachers to assess automaticity of this crucial skill. 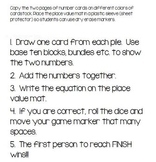 This product has 36 cards that have students adding two-digit numbers by a multiple of 10. You can play a game similar to War with them, play a game similar to Go Fish with them or come up with your own use. This game can be played in a center. 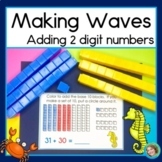 It challenges students to their math fluency and accuracy. 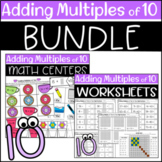 This provides an engaging activity that allows student to practice their basic skills of adding numbers by the multiples of 10. Assembly is required.